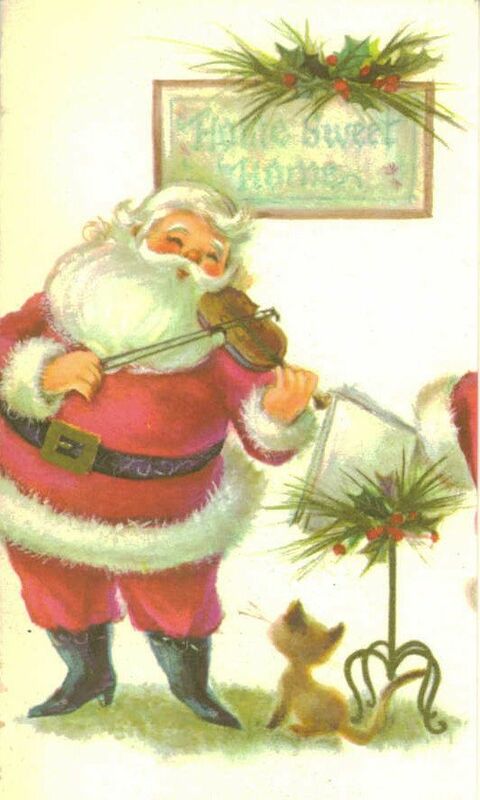 Christmas music was meant to be played on a gold Violin and maybe…….by Santa! There is just something about a violin that reminded me of Christmas’s of the past. Even before my time. When I saw these gold Violins, I knew they would make pretty Christmas gifts or hostess gifts for all the parties this Christmas season. I hate to show up empty handed so why not make something to show your appreciation to all of the friends and family that make your smile all year long but you can also just make one for your home. Never can have enough pretty Christmas decor. I got most of what I needed from Michael’s except the bell and Christmas pick. They came from JoAnn’s and were 60% off. I picked up scrapbook paper that I loved. Musical notes and holly. I tore off pieces of it and burned the edges to create a vintage look. Just use a lighter and burn the edges. Blow out quickly because it doesn’t take long to give your that look. Just put the paper where it fits best. You can layer the 2 different papers. Seal it all with a final coat of Mod Podge. Let the Mod Podge dry. I let mine dry overnight. I also removed the violin strings because I wanted more space for embellishments. I picked up the wooden word Joy and painted it. A little greenery from a Christmas pick and a red ribbon. I just adore the curly q’s look. You can find these at Michael’s. I also added a red bell that I found at JoAnn’s. Add anything that reminds you of Christmas or that is Christmas to you! Can’t you just hear the beautiful Christmas carols being played on a golden Violin? Create one of these for the music lover friend in your life or for your home. You can always give as a gift too. I have 2 Violin’s left but I am thinking I want to save one for a Mother’s Day gift or for Spring decor. I am thinking I could paint one a pretty spring color. No matter when I make another or how, I just love the process and the inspiration. That is my wish for all of you this Christmas season. That you would feel inspired to create and bless the people in your life. Through out the year and always! May you always live inspired, may you live creatively and always live to the fullest!